The third contestant in the Miss Pacific Islands Pageant (MPIP) PNG is an advocate of education within family as an important tool to groom good citizens. Twenty five year-old Miss Elliot is of mixed Central and Milne Province, and works at the Institute of Business Studies (IBS). She is being sponsored by gold refining company Italpreziosi, which is based in Port Moresby. Miss Elliot said education was a powerful tool that changed lives and with good upbringing, someone’s future could be determined. 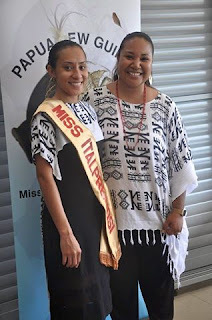 Deputy Chairperson of the Miss Pacific Islands Pageant PNG, Mrs Molly O’Rourke thanked Italpreziosi for supporting the MPIP PNG again this year. Last year Itapreziosi sponsored Miss Takeiti Vetali who went onto win Best Talent and was a joint winner in Best Traditionally Inspired Dress. In the last five years, the MPIP PNG has raised over K500, 000.00 for its scholarship fund and has assisted 152 young girls from around PNG to complete their education. Mrs O’Rourke said this year each contestant would be assigned to a designer from the MPIP Project Runway which was staged on July 30, so that her wardrobe, sarong and Traditionally Inspired Dress can be tailored.